Javi Canovas just keeps getting better. His album Eunomia (69'37") should be required listening for all Earthlings. A swift, neatly arced work, which speaks to the great ideas within us all, it moves beautifully between sonic innovations and zones of manic kinetic invention. 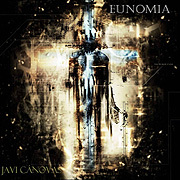 Eunomia plunges the listener into the shifting, churning musical world that Canovas is trying to comprehend. Emitting power and nerve, Eunomia's general spirit of adventure consistently lifts. With a unique buoyancy and vitality Canovas' arrangements boom within a coherent framework. With plenty of room for exploration the sonic setting easily shifts from pastoral synthesizer chords to cascading sequencer pulsation and billowing, go-for-broke lead lines. These moments really add up to something significant, with each of the four tracks traveling assuredly across a distinctive, fascinating region of space. A student of the Berlin-School, it may be that Canovas has not yet grasped its essence - because he is still immersed in its aftershocks... or perhaps we struggle to put cosmic music behind us simply because it is a timeless universal impulse. Relevant still, Javi Canovas operates in a genre that retains its identity - even though all of the original players have been completely re-cast. As listeners we are privileged to commune with the striving of those asserting the right of Electronic Music to blaze its own path, and must hope that mankind will one day inhabit the world Canovas and his like have been making the soundtrack for.